In the thirties of the last century in Germany was issued a Handbook Heigle “Tanks” for many years and then enjoyed great popularity among the military specialists. Already in the first section concerning the tasks performed by different types of armored vehicles, it was noted that “armored vehicles due to their large specific speed used primarily for exploration”, but a little further we read: “when high mobility on roads and a large range of armored vehicles have only a limited permeability in the area” – and one might add: “and no traffic in the presence of water obstacles”. Military manoeuvres, frequently carried out at that time the armies of different countries, ever more convinced of their command of the need to have floating combat means in divisions of advanced intelligence. Preference was given to the armored cars, knowing that they should be adapted to perform certain military tasks. In our country, to a floating army armored vehicles came through the intelligence of the trolley. It was one of the two types of “train combat vehicles,” incorporated by Resolution of the Council of Labor and Defense (No. 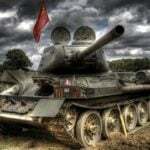 71 SS/on August 13, 1933) for the second five years the system of armored worker-Peasant red Army. 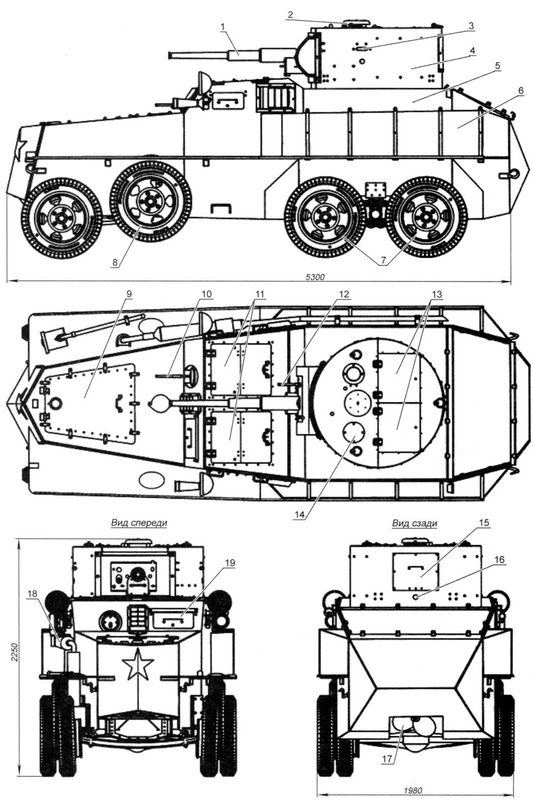 There he explained that a “reconnaissance vehicle – armored vehicle (standard vehicle)”, but slightly modified and put on steel wheels with flanges. Their purpose was reconnaissance and guarding of railway. In fact, this Decision was Taken after the fact, as by this time, there were prepared samples. At the beginning of the 1930s, the country began work on the creation of such modern machines for armored troops. 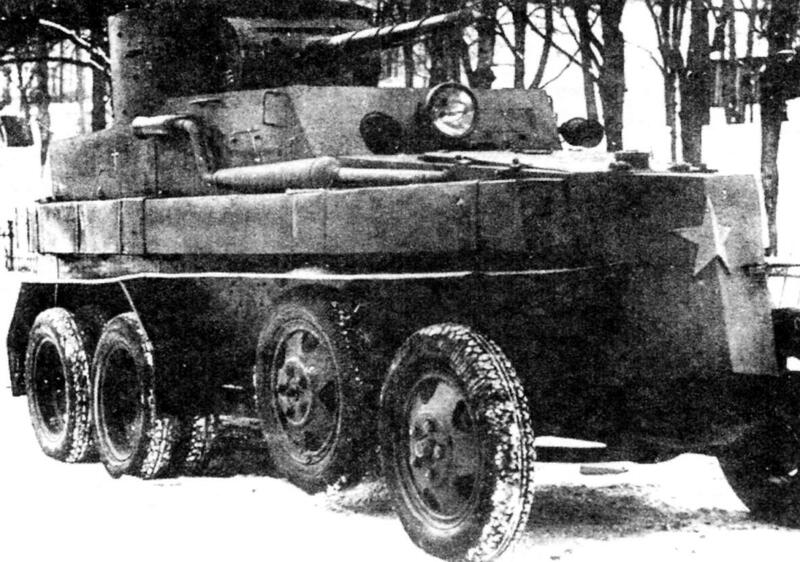 In 1931, in the technical Department economic Department of the OGPU of the Leningrad military district on the basis of the car “Ford-AA” was created duhsasana combat avtorezina BAD-1 armoured body with a total weight of 3.27 T. the arms were five 7.62 mm machine guns. The crew of the trolley is 4. Machine with a 40-horsepower engine could on the rails to reach speeds of almost 100 km/h on the highway speed was more modest – up to 40 km. Then here we have developed a draft design of more powerful armored vehicles on the chassis of a triaxial polnoprotochnogo truck “Ford Timken”. 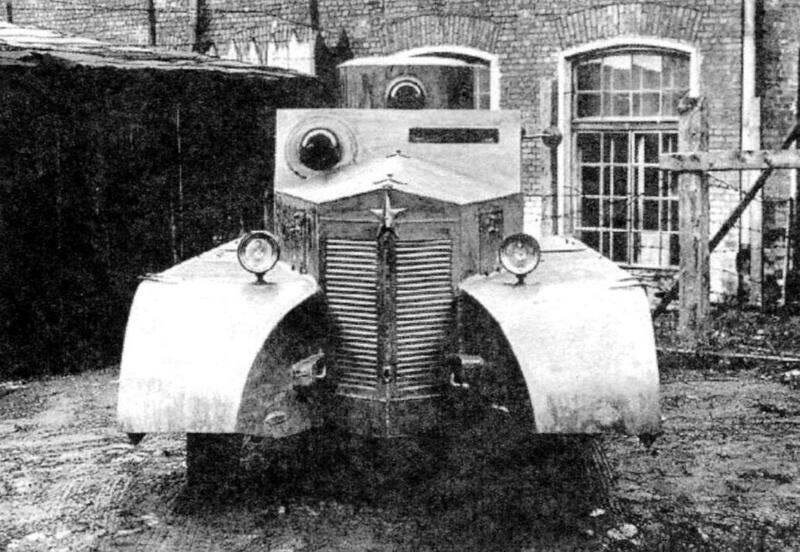 According to this project at the Leningrad plant “Bolshevik” in the spring of 1932 under the leadership of engineer N. Obukhov was the prototype of armored car BAD-2. The developers assumed that the machine can be used not only on the Railways, but the ordinary, even to use as a flotation device, which they had to solve the problem of tightness of the housing. And that’s not all. It was necessary to find and implement into the design of not only optimal ratio of the functional properties and advantages inherent in and armored land vehicles, and floating, without prejudice of some at the expense of others. And securing basic characteristics tacticities tasks, e.g. machine weight, hull, armament, her mobility on land and, at the same time, the agility and speed of the movement afloat. 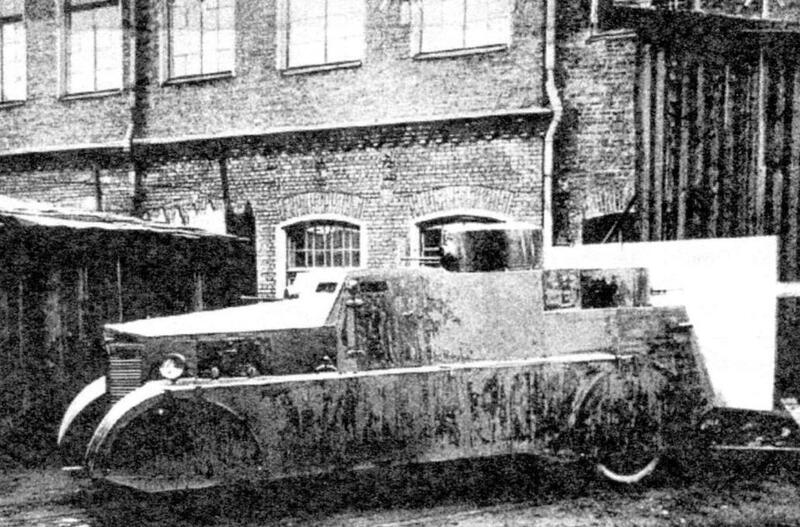 By the spring of 1933 many of the problems were solved, and armored car BAD-2 was presented at a military may day parade in Leningrad. In sight of the surprised inhabitants of the city wheel the car went into the river and successfully crossed the river. 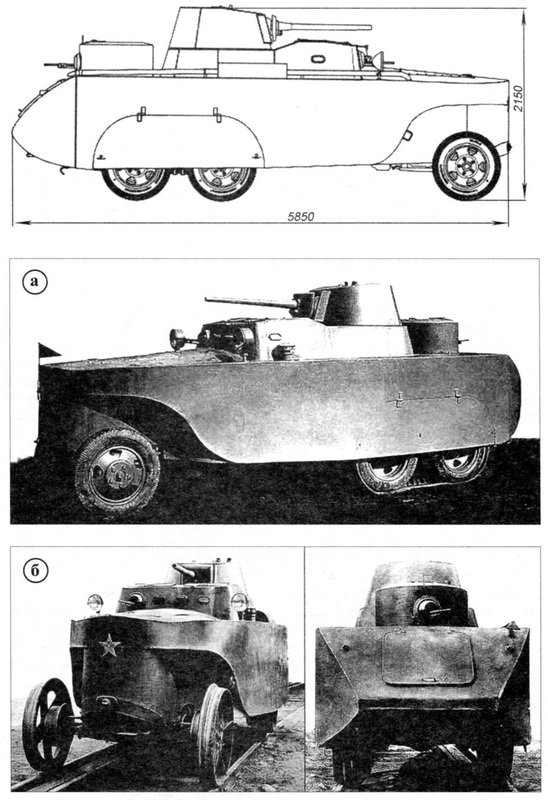 Of course, the case of the floating armored car – fully enclosed -had a boat shape. 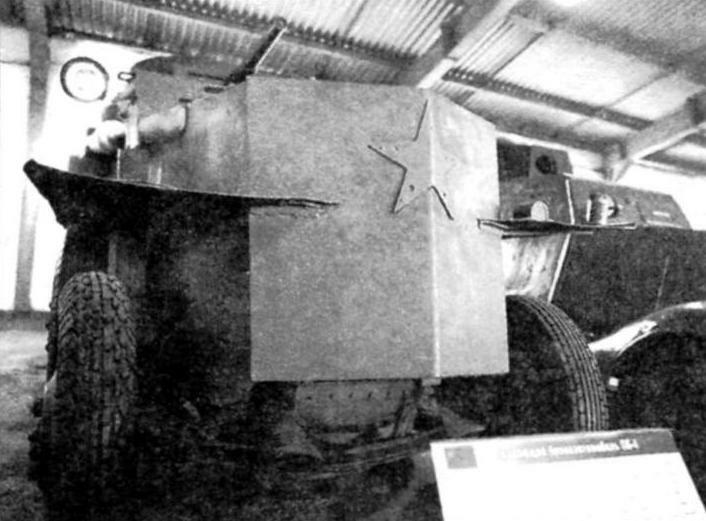 Its leaves rolled steel – thickness 4 – 6 mm were attached to the chassis with bolts, but places and welding; along the sides they were set vertically. On the roof housed the wheelhouse of the fighting compartment (turret box) with two towers: front hex conical tank armed with 37-mm cannon B-3 (5K) and behind her back with a 7.62 mm machine gun; the same gun Degtyarev DT was a ball bearing in the hull. The main tower had a circular attack, the rear – only limited sector equal to 300°. Gun B-3 had a barrel length of 45 klb. Her armor-piercing shells B-160, which had a mass of 0.66 kg and initial speed of 820 m/s in a distance of 100 m at zero angle of meetings to penetrate the armor thickness up to 42 mm, 500 m – up to 35 mm and at 1000 m up to 28 mm. If the impact angle was 30°, the penetration at the same ranges were, respectively, 34 mm, 28 mm, 23 mm and 19 mm. Shrapnel shells could hit targets at a distance up to 5,700 m Rate of fire of the gun – 10 – 15 RDS./min. Shots, the number 60, were in canvas bags in the cockpit; the ammunition machine gun ammunition was 3000. 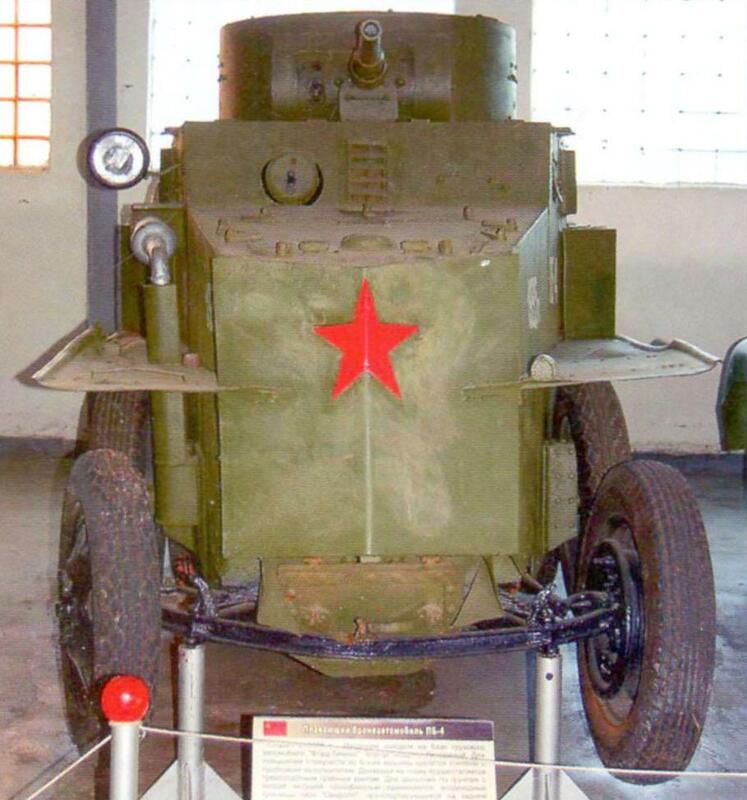 The same guns B-3 at the time, was also armed with T-26 tanks, armored BT-2. The engine designers of the machine placed in front of it. It was a 4-cylinder inline petrol “Ford-A” four-stroke liquid-cooled volume 3285 SMZ, develops a power of 40 HP at 2200 rpm, Like the engine was then raised on the famous automobile “GAZ”. BAD-2 had three-axis polnoprivodnyj suspension wheel formula 6×4. The nodes of the suspension consisted of semi-elliptic leaf springs with torque rods. In mechanical transmission were single-disc clutch, four-speed transmission with dual high transmission, drive axles – both rear worm with the main gear. Car wheel – single wheel pneumatic tyres. When setting the rails, they were replaced by railway wheels. To improve the cross-road at the back leading wheel could be put on metal tracks. The movement on water was carried out using a three-bladed propeller mounted at the stern. He worked from an additional worm drive extending from the main transmission rear axle. However, it turned out that on land at the rear axles and spun the propeller and afloat when it is turned on and spun the rear wheels. Two fuel tanks had a capacity of 40 liters of gasoline, which allowed them to have a power reserve of approximately 120 km. the speed on the highway was 60 km/h with worn treads of the lane – up to 50 km/h on rails – 90 km/h, afloat – 6 km/h. Combat weight BAD 2 was 4.6 so was Calculated the armored car for a crew of 4 people. At the same time the mechanization and motorization of the red army gave the job to the Leningrad machine-building plant “Zvezda” to them. K. E. Voroshilova (or Zavod No. 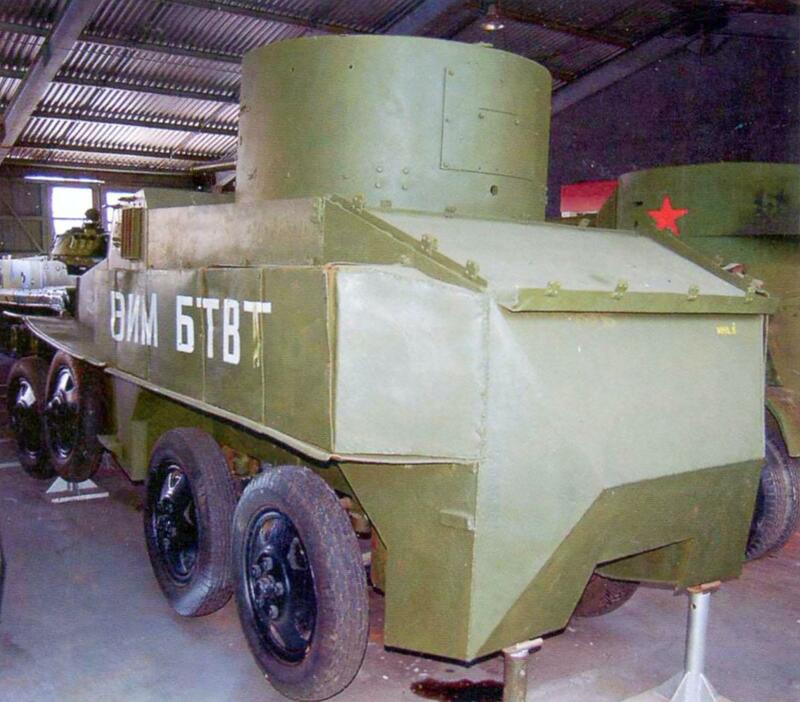 174, a former factory “Bolshevik”) on “design and fabrication of an improved prototype floating armored car BAD-3”. However, the factory at the appointed time did not meet. Then the military gave the BAD 3 in a plan Izhora plant in 1933 where to this time was created the Central Armor lab No. 1 (CBL-1), issue 25 BAD 2, but then their number was reduced to 15 units. But this number was not performed due to restart of the plant other military products, including the production of tanks T-26. After receiving the order, the staff of factory KB for the design of technological maps of manufacturing cases encountered great difficulties because of its hydrodynamic shape. 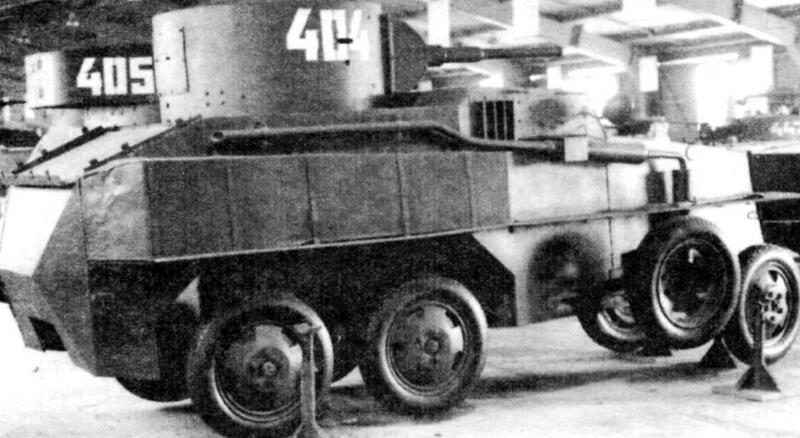 Having a change of machine configuration, they then decided to design a new floating armored car, which was later index PB-4. The designers of the “simplified” case, rejecting the pure boat Chine hull form. Now the car is in form more like the average cannon BA-3, developed here at the Izhora plant. The new PB-4 was designed frameless unibody, of course, waterproof, welded. His armor plates thickness 4 – 7 mm in the topside had a significant tilt angles. Due to the fact that the weight of the car reached almost 5.3 t, along the sides to increase displacement and improve the stability of installed wooden floats (according to some sources, cork) in the iron shell. 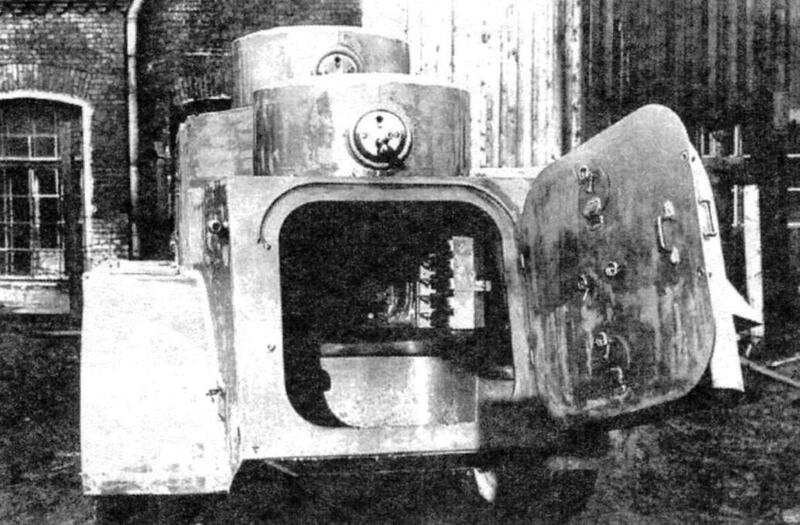 The layout of the armored car with a front location of the power plant remained the same. Wheel formula – 6×4 rear drive axles, and driveshaft were held outside through seals in the bottom. Drivetrain and suspension from the previous a little different. Not changed the scheme of movement afloat – with the help of the propeller, driven by the main transmission rear axle. The engine put the same 40-horsepower GAS-A. However, significantly changed its cooling system. Made the bottom hatch through which the incoming air flow was coming from the radiator; afloat it is hermetically closed. Then the case enters the pipe coil heat exchanger located under the bottom, the water system passing through it cooled. Also arranged along the sides of the mine vent to release hot air. Access to the engine was from a hatch on the roof of the power pack. On the turret box, closer to the rear of the machine, placed a rotating turret, which had a cylindrical shape. By design, it was close to the one that stood on the T-26, but without the rear bin. However, this tower stood on the armored car BA-3. The tower was 45-mm tank gun, 20K and paired 7.62-mm machine gun DT. The same DT was in the right part of the front plate of the housing. 20K gun could fire at armored targets and artillery guns, fire weapons, open the enemy manpower in shelters as armor-piercing and high-explosive shells. She had a great time tacticities characteristics. 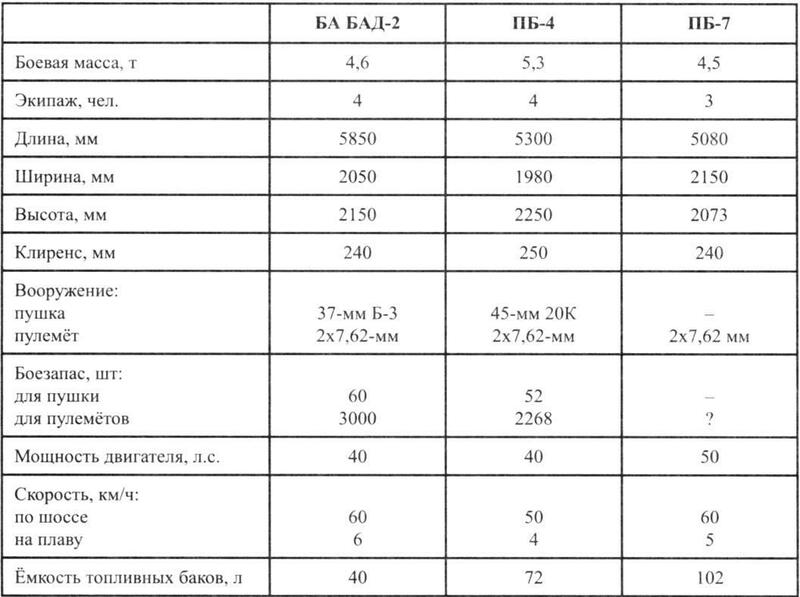 Thus, the maximum shooting distance was 4,200 m in the range of a direct shot 3600 m. armor-Piercing shell BR-240СП weight of 1.43 kg having an initial velocity of 760 m/s, at a distance of 500 m pierced the armor thickness of 45 mm, and 1500 m – 28 mm. the Rate of gun – 7 – 12 RDS./min. Ammunition guns 20K on the armored car PB-4 was 52 shots, hosted both in the tower and in the rear of the hull, out of machine gun ammo was 2268 pieces 36 disks. Shooting a gun was used telescopic sight TOP and panoramic periscope PT-1, for a machine gun is a mechanical gun. In the sides of the tower were vision devices “Triplex”, the loopholes for firing personal weapons, the stern hatch for Dismounting the guns. In the roof of the tower there were two hatches for entry and exit of the crew, the same two were fitted in the front of the case. The rotation of the tower took place with the help of a manual drive, and turns demanded quite a lot of effort. In the tower there were two outboard seats for the gunner and loader. For pumping falling in case sea water near the driver installed manual pump 20 l / min. 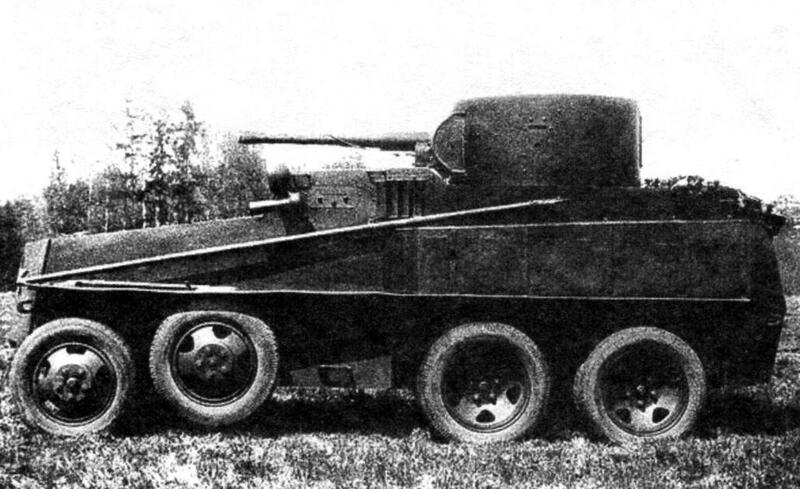 By September 1933, the Izhora plant set for tests of three armored car PB-4, in February next year – three more. In April 1934 PB-4 along with armored cars BA-3 participated in a four day test run Kolpino – Moscow, dedicated to the celebration of 1 May. The results showed that the machine can develop the speed on the highway to 50 km/h, unpaved roads to 20 km/h, afloat – up to 3-4 km/h (according to other sources, 6 -8 km/h); however, to enter the water and onto the shore used caterpillar “Overall” put on the axles. Only in 1934 – 1935 he was made six of the armored car PB-4, but one of them for some unknown reason, was dismantled the following year. 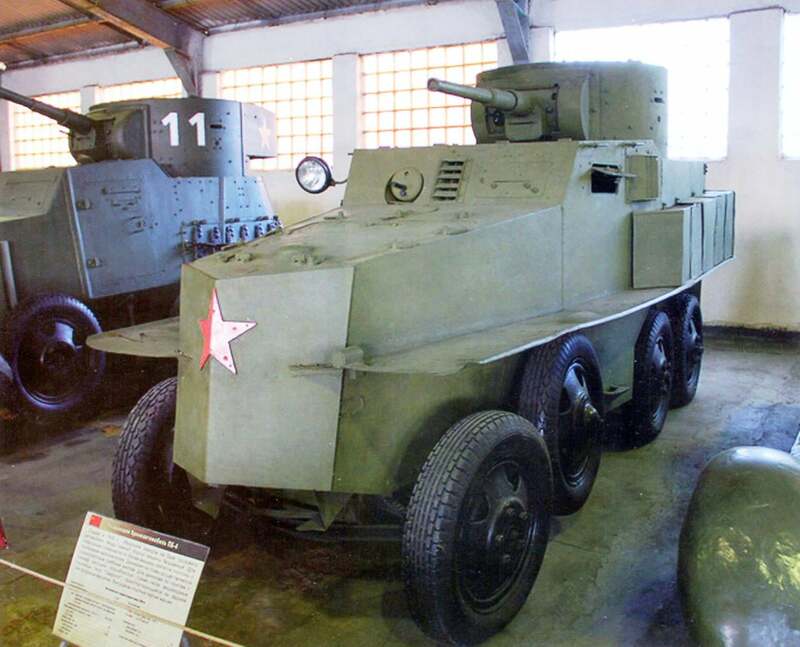 In 1936 KB Izhora factory produced new model of an armored car floating under PB index-7 using the chassis of the truck GAZ-AAA. Machine is different from the PB-4 some improvements and had other weapons. Welded her body had better the hydrodynamics of the underwater part, there was no pontoons on the sides. Armor plates had a thickness of 4, 6 and 8 mm. Reinforced chassis and suspension. The engine mounted a more powerful 50-horsepower GAZ M-1, gasoline 4-cylinder liquid-cooled. This was on the passenger car GAZ-M1, which replaced the previously produced GAS-A. to access the motor in the front hull there was a hatch. Special attention was paid to cooling the motor. The radiator of the car the GAS was replaced with a new six-row with capacity of 20 liters, is installed on the T-37, put a powerful fan. This is in addition to the heat exchanger and air intake hatch in the front of the case. Tower PB-7 stood in the rear of the machine. It gave a conical shape with inclination angles of the sides is approximately 30°. On top of the tower was placed a hatch in the hinged lid of which were two flap – ventilation and for signaling connection flags. In the sides there are three loopholes. 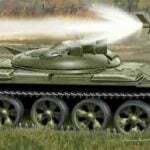 Initially, the armored car put a 7.62 mm ShKAS machine gun (machine gun Shpitalny-Komaritsky aircraft rapid-fire). But then the arms were replaced by two coaxial 7.62-mm machine gun DT. Their ammunition was 4032 cartridge. Afloat also worked as a stern thruster, but now, unlike previous models, when the land it can be disabled, however, leaving the car. To turn on the water to help the front wheels at the aft mounted rudder, controlled by ropes from the driver’s seat. 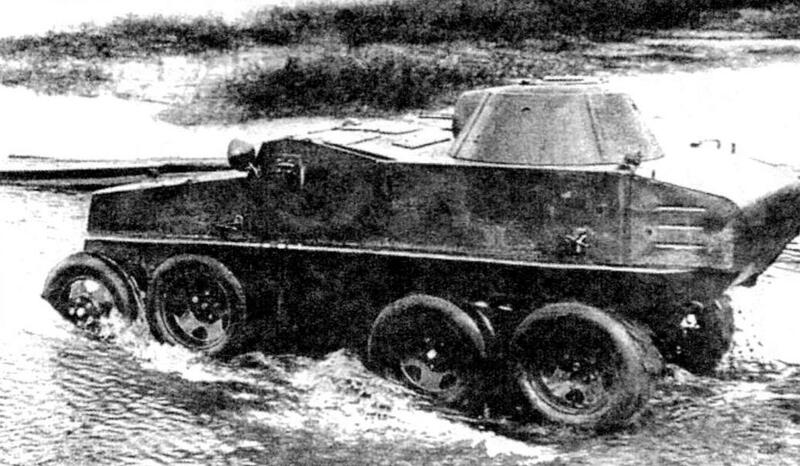 In 1937 armored car PB-7 was tested, including on the river Izhora, showing the speed afloat 4-5 km/h. On land the 4.6-ton machine developed a speed of 60 km/h 102 litres of fuel in two tanks placed under the seats in front of the machine, provided the range of up to 250 km on highway and 170 km in the country. The overall conclusion of the Commission at the end of the test was encouraging, recommended refinement of the structure before adopting. However, by this time in the USSR became mass-produce light amphibious tanks, which had a weight of even less than a floating armored cars. 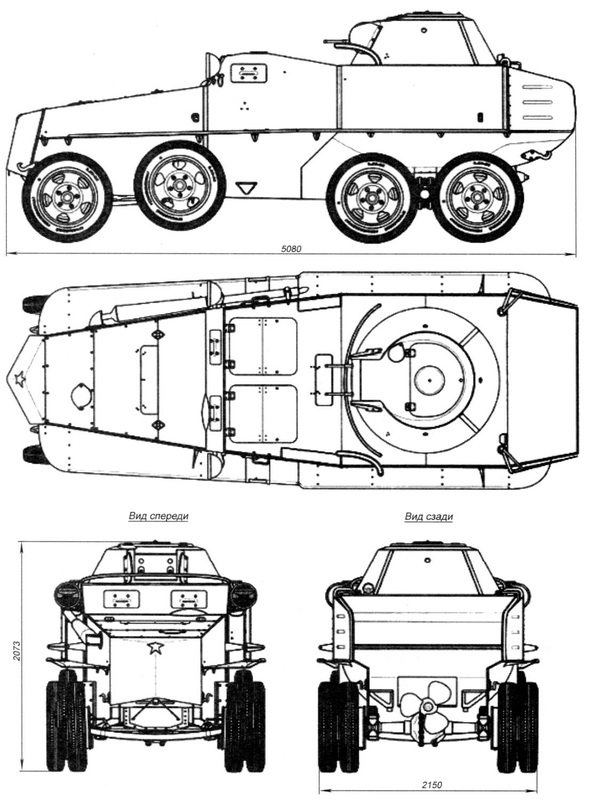 Perhaps this was the reason that the military refused to continue finishing the SDS-7 to the batch, as it does from the development of projects floating armored vehicles.